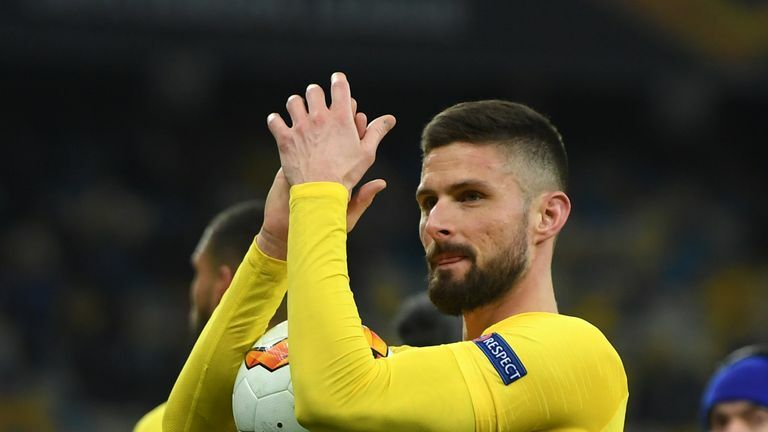 Giroud scored the third goal in France's 4-1 win over Moldova on Friday and his international boss paid tribute to his striker after impressing in their opening European Qualifier. "Giroud is there, he scores goals. He does so too with his club," Deschamps said ahead of Monday night's clash with Iceland, live on Sky Sports. Giroud has started just six games under Maurizio Sarri in the Premier League, but has made 15 appearances from the bench. The Frenchman has been a regular in the Europa League, however, with nine goals in nine games. Deschamps also spoke about the mentality of his players after their World Cup win in the summer, highlighting how important Giroud, Paul Pogba and Antoine Griezmann are in keeping the group focused. "I wasn't really worried because since the beginning of the week, I had told them what I wanted to tell them about the match through the sessions we had - there was a lot of dedication," added Deschamps. "It seems normal and logical but I do appreciate the quality and the mindset we have. "The players know it, it's how we got to where we got last summer and that's something we absolutely need to keep regardless of the match and the players we are facing."